Introducing today a nice series of scarves by Risey Arai for “Sey”: Afghan stoles. They come in many patterns (”simple” one shown today, paisley and checkered are available), each of them offering a complete script menu driven to change color (10 available on this one) and size. The design of this scarf is quite original and it’s a nice addition to any male inventory! Copy, No Transfer to add in all your outfit folders, 280 Lindens per item. 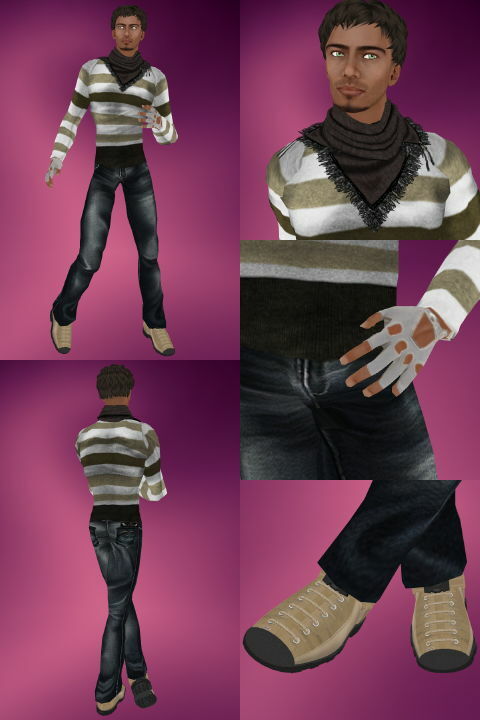 This scarf matches very well with this long sleeve striped T-Shirt/sweater from “Lookr.” For 135 Lindens, you will get every layer you could possibly dream of for this very laid back item, showing a well done texture with subdued shades of beige. “Cosy” comes in three other colors. Copy, No transfer, and Moddable like every creation from customer conscious designers! Also wearing: great jeans from “Casa del Shai” (complete review here), the last creation from “JCS”, aXion (full review here,) cool (and very cheap) gloves from “Pixeldolls” (you will find them in the new accessories department), short hair from “Exile,” Aries, in this amazing brown called “Mink,” and a very good skin from “Signature,” the latest one called “Blaze” that will be fully reviewed soon. Enjoy! hi nice blog!! kindly visit my blogs ome, dizzle, spring and dreamz. Guys, just a little thing about the new mirror effect for the photo page layout. I like the glass shiny idea, but on safari, you have a black frame on the recto, whereas it is not framed on the upside down version, and then you get a slight offset on the left. You always find the most wonderful shoes!